A ruler of the synagogue whom daughter had just died came to Jesus. Jesus quickly arose with His disciples and went along with the ruler to his house. So the woman went and touched the hem of Jesus’ garment and she was instantly made well. 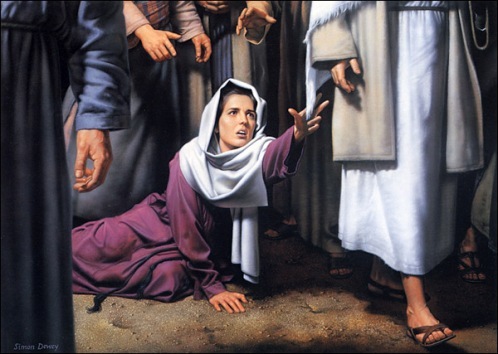 The woman was very afraid, and knowing that she was healed, she fell down before Jesus and told Him the whole truth. When Jesus and his disciples reached the ruler of the synagogue’s house, the crowd was very noisy. There was a great commotion of people weeping and playing flutes because the girl is dead. Jesus put everyone outside of the house but He took the girl’s father and mother and His three disciples, Peter, James and John with him into the house. The girl woke up and she was well. Then Jesus commanded the girl’s father and mother to give her some food to eat. The girl was twelve years old.